Edo Shonin’s interview of Jon Kabat-Zinn [published as an online exclusive on The Psychologist website] is timely particularly in light of recent calls by the Mental Health Foundation for mindfulness to be made more readily available on the NHS. However, the debate regarding the clinical use of mindfulness has never really been about whether it leads to health benefits. 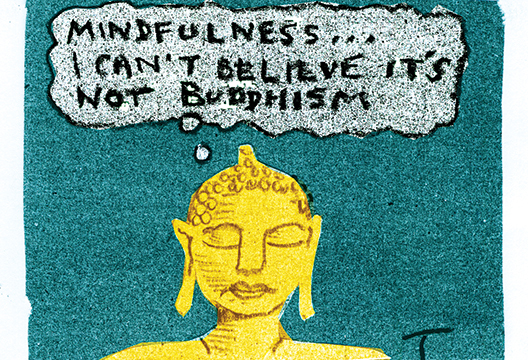 Rather, mindfulness stakeholders have repeatedly deliberated (in some cases quite fiercely) whether ‘mindfulness’, as it is conceptualised in interventions such as mindfulness-based stress reduction (MBSR), still bears meaningful resemblance to the traditional Buddhist interpretation of this term (Monteiro et al., 2015). Kabat-Zinn states that his teachings and the intervention he developed (MBSR) are not: (a) about Buddhism per se, or (b) spiritual in nature. However, he then states that MBSR is about ‘the movement of the Dharma into the mainstream of society’ (‘Dharma’ means the Buddhist teachings). The rhetoric used by Kabat-Zinn is arguably both confusing and misleading. How can an approach that purports to be bringing Buddhist teachings into the mainstream not be about Buddhism and not be spiritual in nature? Patients receiving mindfulness-based interventions are invariably under the impression that they are receiving a clinical intervention to assist with mental health issues. However, if in conjunction with treating such issues, the primary purpose of interventions such as MBSR is to expound the Buddhist teachings, then there is an ethical obligation to make this abundantly clear to participants. Most mindfulness approaches include in their name the term ‘mindfulness-based’. On the surface, this appears to be an entirely acceptable and transparent approach because it implies that such interventions are based on mindfulness, but do not teach mindfulness in a manner that is necessarily in keeping with the Buddhist model. In other words, the term ‘mindfulness-based’ is consistent with what is arguably a common understanding amongst psychologists that these interventions have adapted a Buddhist (and therefore spiritual) meditative technique in order to develop an attention-based psychological intervention. A problem arises however, when individuals such as Kabat-Zinn give the impression that MBSR and similar mindfulness-based approaches operationalise the Buddhist teachings in all of their ‘essential fullness’ (Williams & Kabat-Zinn, 2011, p.15). A key difference between Buddhism and MBSR is that in the case of the former, mindfulness constitutes only a small part of the meditative journey and is practised in the context of a comprehensive set of guiding ethical and spiritual principles (Shonin, Van Gordon, & Griffiths, 2014). This is very different from the ethics taught in MBSR, which, according to Kabat-Zinn, are embodied by the Hippocratic Oath (i.e. First do no harm). In the Buddhist setting, the ethical code of the authentic mindfulness and Dharma practitioner goes well beyond simply ‘doing no harm’ and requires that they dedicate each of their thoughts, words, and actions to their own and others’ spiritual development (Chah, 2011; Dalai Lama, 2001). Shonin’s questions provided Kabat-Zinn with an opportunity to clarify some of the ambiguity surrounding the popular mindfulness movement. However, in our opinion, elements of the responses were vague and contradictory. Furthermore, aspects of Kabat-Zinn’s approach appear to run tangential to established principles concerning the transmission of the Buddhist teachings. For example, a central theme of Buddhist training is that individuals should approach Buddhist teachings with the ‘right intention’ (i.e. to develop spiritually) and of their own accord. In other words, authentic Buddhism does not seek to ‘convert’ people or force its ideals onto them. This is quite different to what appears to be Kabat-Zinn’s approach of thrusting (what he deems to be) Buddhism into the mainstream and teaching it to the unsuspecting masses (i.e. without their ‘informed consent’). Editor Jon Sutton comments: It’s good to see an online offering sparking discussion and debate. The interview with Jon Kabat-Zinn, as well as one with John Amaechi OBE, was published ‘online first’ at http://thepsychologist.bps.org.uk. They may well only be published online: I am still trying out different ways of integrating our print and web offerings. Don’t miss out: keep an eye on the site and follow us on Twitter. Note: See also our archive trawl on mindfulness on The Psychologist and Research Digest. Chah, A. (2011). The collected teachings of Ajahn Chah. Northumberland: Aruna Publications. Dalai Lama (2001). Stages of meditation: Training the mind for wisdom. London: Rider. Monteiro, L.M., Musten, R.F. & Compson, J. (2015). Traditional and contemporary mindfulness: Finding the middle path in the tangle of concerns. Mindfulness, 6, 1–13. Shonin, E., Van Gordon W. & Griffiths, M.D. (2014). The emerging role of Buddhism in clinical psychology. Psychology of Religion and Spirituality, 6, 123–137. Williams, J.M.G. & Kabat-Zinn, J. (2011). Mindfulness: Diverse perspectives on its meaning, origins, and multiple applications at the intersection of science and dharma. Contemporary Buddhism, 12, 1–18.